Thursday, December 16th is the 10th Anniversary of the deadly F4 tornado that ripped through Tuscaloosa County, killing 11 people. The Taylorville/Hillcrest areas of Tuscaloosa sustained the most damage from the tornado. That day changed the lives of many families in Tuscaloosa and West Alabama. 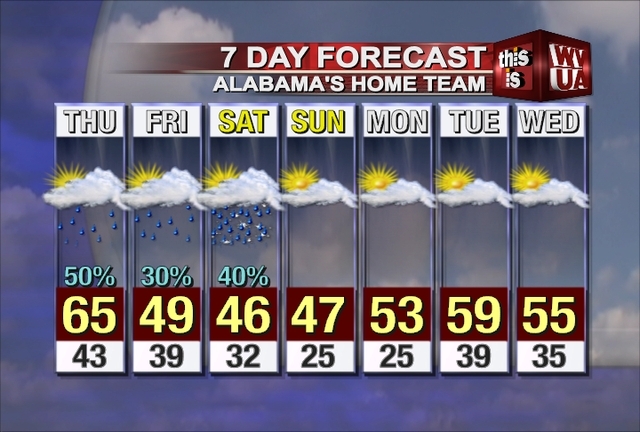 Today we will be dealing with scattered showers in West Alabama and warmer temperatures. Highs today will reach the upper 50’s to middle 60’s. Cooler air will move in this evening…but rain chances will continue. A low pressure area is forecast to develop south of Tuscaloosa late Friday, moving south of our area through early Saturday. There may be a chance of a few flurries early Saturday as a result of this system. We will keep you posted on winter precipitation chances and types as we get closer to the weekend.